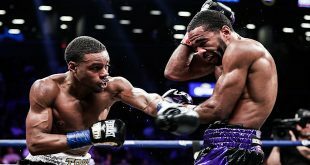 Light middleweight Paul Williams posted a debatable majority decision last night over highly touted prospect Erislandy Lara last night in the main event of a big show at Atlantic City's Boardwalk Hall. Williams was coming off a crushing second round KO in a rematch with WBC middleweight champ Sergio Martinez while Lara was stepping up in class after being held to a draw by upset specialist Carlos Molina. The first frame illustrated Lara's edge in quickness and balance as the prospect had no problem landing left hands on Williams, who came forward, throwing more punches with less accuracy. Williams used the jab more in the second, making his pressure more effective against Lara, who was still landing at a high percentage but wasn't active enough to take advantage of this. Lara started clinching anytime Williams got in close, making for an ugly, tangled third round. Williams let loose in the fourth, throwing everything but not connecting with much while Lara began to land bracing left power hands between bouts of wrestling in the clinches. In a change of tactics, Lara tried to fight Williams on the inside rather than clinching in the fifth and got hit with a lot of body shots and hooks for his trouble. Lara still accurate when he did throw but was outworked by a much busier opponent. After a few unintentional head clashes, Williams was cut on the left eyelid while Lara developed an ever growing knot of swelling to his left temple. Lara went back to clinching a lot in the sixth but wasn't tying up the hands of Williams, who threw and landed a lot of short shots as Lara basically just stood there with gloves up. When he did punch, Lara connected but he just wasn't throwing enough to produce a winning round. The seventh saw Williams operating on the outside but this allowed Lara the room to exercise his better boxing skills and he caught Williams with quality punches until the action went inside where Williams outworked and outlanded the Cuban. Williams finally began to use his height with the jab in the eighth but was still outboxed by the quicker Lara, who again didn't throw enough punches to leverage this, particularly when things went to close quarters where Lara hardly punched while Williams never stopped winging shots. Lara had a better ninth round, scoring with more big lefts and getting hit less in return. Williams mounted a comeback in the tenth as Lara didn't throw much, allowing the former welterweight champ to score with a lot of punches on the inside. Lara got on his bike in the eleventh as Williams gave chase but ate powerful left hands for his trouble. Again, Williams outworked Lara when it goes to the inside but couldn't erase the heavy scoring of Lara early on in the frame. The twelfth saw Lara mostly try to run out the clock, grabbing a lot and throwing little while Williams punched more, but didn't land a lot. It was a difficult fight to judge as Lara, clearly the better boxer who scored with the more accurate, cleaner blows, was outworked by the much busier Williams. 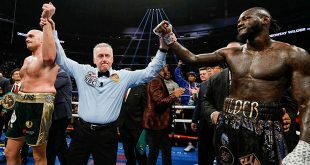 When the scores were read, Williams was awarded a controversial majority decision, winning two cards by scores of 116-114, 115-114 while a third card was even at 114-114. SaddoBoxing scored the bout 117-115 in favor of Lara. Williams improves to 40-2 (27), while Lara drops his first professional contest and now stands at 15-1-1 (10). Look for a mandated rematch, given the nature of the decision. There were good fights on the undercard, with two world title clashes leading the way. 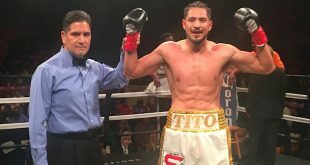 WBC featherweight champ Jhonny Gonzalez, 49-7 (43), proved too experienced for Tomas Villa, 23-8-4 (13), stopping the challenger in the fourth. WBA super bantam titlist Akifumi Shimoda, 23-3-1 (10), was well on his way to outboxing challenger Rico Ramos, 20-0 (11), until Ramos uncorked a perfect left hand that KO's Shimoda at 2:46 of the seventh. Heavyweight contender Chris Arreola, 32-2 (28), continued on the comeback trail, winning his fifth on the bounce by widely outpointing Friday Ahunanya, 24-8-3 (13), over ten frames.